Under the threats of climate change, the Drainage Services Department (DSD) has been implementing a sustainable drainage system with an aim to building flood resilience and improving the living environment of Hong Kong. Hong Kong is one of the most densely populated cities in the world. It is prone to tropical cyclones with an average annual rainfall of about 2400mm, making it one of the world’s wettest cities. Under this climatic setting, Hong Kong often experienced substantial flooding in the 1990s. upgrading drainage pipework at the downstream. Since its establishment in 1989, the DSD has completed a number of major flood prevention projects. DSD now owns approximately 2,400km of stormwater drains, 360km of river channels, 21km of interception drainage tunnels, 3 stormwater storage tanks and runs 27 village flood protection schemes. With these robust and reliable drainage infrastructure, DSD has successfully reduced the number of flooding blackspots in the city from 90 to 7. However, such infrastructure requires further enhancement to adapt to the extreme weather conditions brought on by climate change. In 2008, the peak hourly rainfall intensity surged to a record high of 145.5mm. Sea level has also been recorded to be rising at a rate of 31mm per decade. At the same time, rural areas are being developed to cope with the city’s long term economic and population growth. To tackle these challenges, DSD has started to explore more sustainable solutions for the drainage system and will gradually evolve the existing drainage infrastructure into blue-green infrastructure. A sustainable drainage system, or blue-green infrastructure, mimics the natural water cycle. In contrast to the traditional urban runoff system, which results in low evaporation, low infiltration and high surface runoff, a sustainable drainage system promotes high evaporation, high infiltration and low surface runoff. Examples of sustainable drainage systems include green roofs, rain gardens, retention lakes, porous pavements, water harvesting, bioswales, wetlands and river revitalisations. By designing the city like a sponge, flood resilience can be built into the existing drainage infrastructure. … examples include green roofs, water harvesting, wetlands etc. In the past years, DSD has gained a wide range of experience in the implementation of a sustainable drainage system. It has installed green roofs and vertical greening on 70 of its facilities including sewage treatment works and pumping stations with a total area of 30,000m2. The installation of green roofs is on-going at a rate of about 4,000m2 per year. DSD has also implemented water harvesting at Lai Chi Kok Drainage Tunnel and the Happy Valley Underground Stormwater Storage Scheme which has resulted in annual water savings of 44,000m3 and 220,000m3 respectively. The harvested water can be used for toilet flushing, irrigation and street cleansing. For some river training works such as the completed Ho Chung River and Lam Tsuen River, and the on-going projects like Shenzhen River and Kai Tak River, greening, ecological enhancement and water friendliness have been incorporated into the river channel design. A retention lake is being constructed on Shenzhen River to attenuate the peak runoff during heavy rainstorms and to provide a natural environment for wildlife, birds, etc, on calmer days. 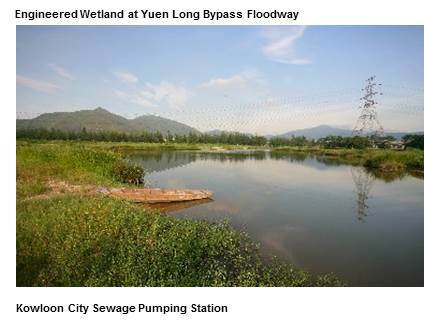 In the Yuen Long Bypass Floodway project which partly diverts stormwater from the highly populated Yuen Long Town Centre to Kam Tin River, DSD has turned several abandoned fish ponds into an engineered wetland. The 7-hectare wetland provides a large freshwater habitat for birds and wildlife, and also serves as a purification and temporary storage area for stormwater. 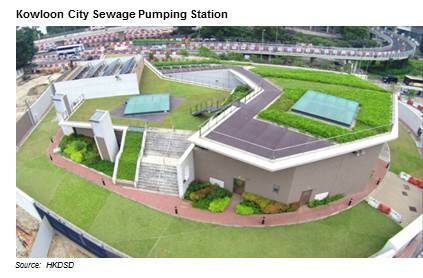 DSD’s project “Kowloon City Sewage Pumping Station” showcases the combined use of sustainable drainage systems in a built environment. It adopts several stormwater management measures including green roofs, porous pavements, rain gardens and water harvesting systems. The project became the first government facility to obtain the BEAM Plus Platinum rating, the highest rating for green buildings. Notwithstanding the above experiences on sustainable drainage system, DSD is exploring more applications in new development areas. 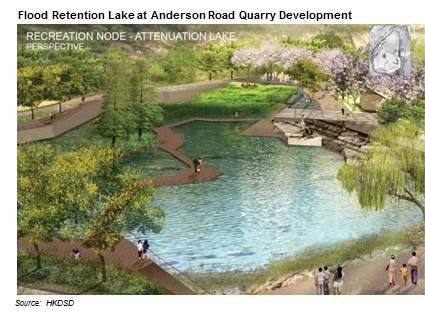 For example, in the Anderson Road Quarry Development, DSD is pushing forward the first flood retention lake in Hong Kong. It will become an open space with landscape feature for public enjoyment on dry days, and operate as the function of flood attenuation during the wet season. Moreover, Hong Kong’s first river park is being envisaged at Tung Chung River where the public can get close to the river for enjoyment. In order to balance the impact to the habitat and enjoyment of the public, passive designs such as boardwalks, viewing decks and footpaths have been planned and native vegetation will be preserved as far as possible to maintain the existing habitat. To uphold a high water quality on the Tung Chung River, biofiltration has been proposed to purify the stormwater collected from the adjacent developed areas. The river park will set an example for the public to treasure rivers as crucial social and ecological resource. In addition, DSD is also planning the “Inter-Reservoirs Transfer Scheme”, which will see the construction of a water tunnel between the Kowloon Reservoir Group and the Lower Shing Mun Reservoir. The project serves a dual purpose: to substantially reduce stormwater discharge into the drainage system and to channel the overflow into the Lower Shing Mun Reservoir via the proposed tunnel to generate extra annual raw water yield at about 2.5 million m3. 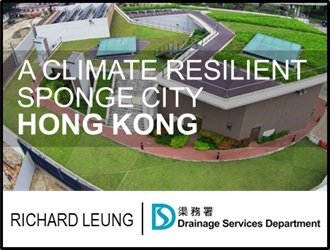 DSD’s efforts in turning Hong Kong into a climate ready and flood resilient sponge city demonstrates a paradigmatic change in drainage infrastructure design – from a “resistance” approach to a more sustainable “resilient” approach. The change is crucial for Hong Kong to adapt and recover after the extreme weather events in the uncertain future. 8 Things You Should Know About Hong Kong Water – Is Hong Kong’s water supply guaranteed? Can you drink straight from the tap? How much bottled water does Hong Kong consume? China Water Risk sets out 8 interesting facts about Hong Kong water. Ir Richard WM LEUNG is a civil engineer by profession. After graduation from the University of Sheffield in the UK in 1988, he worked as an engineer in the Civil Engineering Development Department and Drainage Services Department since 1995 and 2006 respectively. Ir LEUNG is also an Accredited BEAM Professional of the Hong Kong Green Building Council since 2012. Ir LEUNG has been involved in various stages of planning, design and construction of numbers of new town development projects and drainage/sewerage works. Ir LEUNG is currently the senior engineer of the Research & Development Section in Land Drainage Division in the department. He is responsible for the overall coordination of the research & development projects and planning and promotion of the blue green infrastructure for the department.